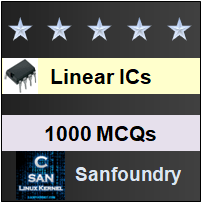 This set of Linear Integrated Circuit Multiple Choice Questions & Answers (MCQs) focuses on “First Order Low Pass Butterworth Filter”. 2. Find the complex equation for the gain of the first order low pass butterworth filter as a function of frequency. Explanation: Gain of the filter, as a function of frequency is given as VO/ Vin=A F/(1+j(f/fH)). 3. Compute the pass band gain and high cut-off frequency for the first order high pass filter. =>AF=1+(10kΩ/10kΩ)=2. The high cut-off frequency of the filter, fH=1/2πRC =1/(2π×20kΩ×0.01µF) =1/1.256×10-3 =796.18Hz. Explanation: The mentioned answer can be obtained, if the value of frequencies are substituted in the gain magnitude equation |(Vo/Vin)|=AF/√(1+(f/fH)2). 5. Determine the gain of the first order low pass filter if the phase angle is 59.77o and the pass band gain is 7. Explanation: The frequency, f=fH is called cut-off frequency, because the gain of the filter at this frequency is down by 3dB from 0Hz. Cut-off frequency is also called as break frequency, corner frequency or 3dB frequency. 7. 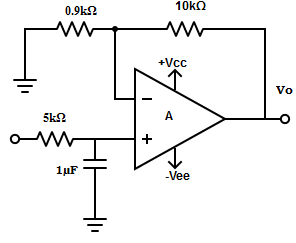 Find the High cut-off frequency if the pass band gain of a filter is 10. 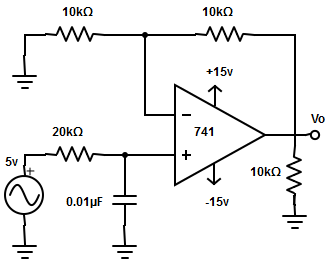 Explanation: Once a filter is designed, it may sometimes be a need to change it’s cut-off frequency. The procedure used to convert an original cut-off frequency fH to a new cut-off frequency is called frequency scaling. Explanation: To change a cut-off frequency from 10kHz to 16kHz,multiply 15.9kΩ resistor. [Original cut-off frequency/New cut-off frequency] =10kHz/16kHz =0.625. ∴ R =0.625×15.9kΩ =9.94kΩ. However 9.94kΩ is not a standard value. So, a potentiometer of 10kΩ is taken and adjusted to 9.94kΩ. 10. Find the difference in gain magnitude for a filter ,if it is the response obtained for frequencies f1=200Hz and f2=3kHz. Specification: AF=2 and fH=1kHz. Explanation: When f1=200Hz, VO(1)/Vin =AF/√ [1+(f/fH)2] =2/√ [1+(200/1kHz) 2] =2/1.0198. When f=700Hz, VO(2)/Vin= 2/√ [1+(700/1kHz) 2] =2/1.22=1.638. => VO(2)/Vin =20log|(VO/Vin|=20log(1.638) = 4.28. Therefore, the difference in the gain magnitude is given as VO(1)/Vin-VO(2)/Vin =5.85-4.28 =1.56 dB. 11. Design a low pass filter at a cut-off frequency 1.6Hz with a pass band gain of 2. R= 9.9kΩ ≅ 10kΩ. Since the pass band gain is 2. => 2=1+ (RF/R1). Therefore, RF and R1 must be equal.